The Spektr-R radio telescope at Baikonur Space Center, within the integration and test complex of Launch Pad No.31. 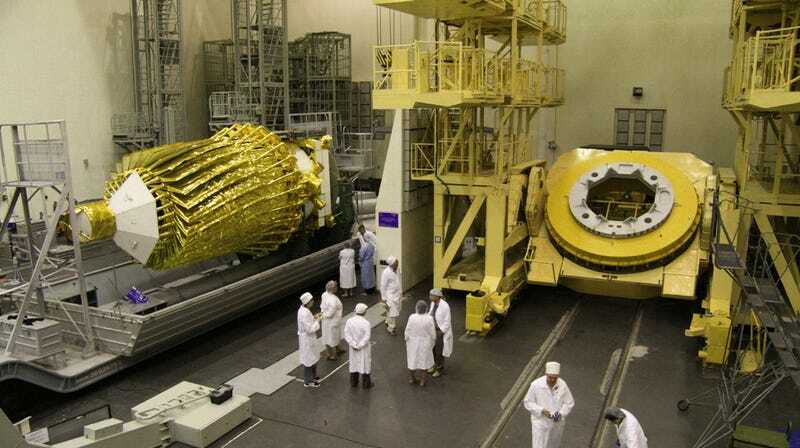 Russia’s only orbiting space radio telescope, Spektr-R (RadioAstron), has stopped responding to the spacecraft’s control staff, the BBC reported Saturday, though Astro Space Centre chief Nikolai Kardashev told the BBC that it is still transmitting scientific data. Spekt-R has a 33-foot radio antenna dish that works in conjunction with ground-based radio telescopes under an international program. According to the BBC, Roscosmos staff said that the craft—launched in July 2011 on a Zenit-3F expendable carrier rocket—has operated well beyond an original five-year projected lifespan. It stopped responding on Friday, despite repeated attempts to re-establish a connection. Spektr-R head of research Yuri Kovalev told the BBC “there is still hope” that Roscosmos staff will be able to restore functionality. “Specialists of the Main Operational Group of Spacecraft Control are carrying out work to remove the existing problems… Beginning with January 10, 2019, problems emerged in the operation of the service systems that currently make it impossible to tackle a targeted task,” Roscosmos wrote in a statement to TASS, Russia’s state-run news agency. Additional details on the nature of the malfunction were not immediately available. The new program is focused on studies of inner regions of active galaxy nuclei and magnetic fields, monitoring of the brightest quasars, research of water-vapor clouds in space, pulsars and interstellar matter, gravitational experimentation, etc. The RadioAstron project is based on a ten-meter orbital radio-telescope, the unique astrophysical observatory Spektr-R which forms an integrated radio interferometer with a super-large base together with ground-based radio-telescopes. The observatory is tasked with conducting fundamental astrophysical studies in electromagnetic spectrum bands. RadioAstron has a record discrimination based on distances of up to 350,000 kilometers between telescopes. Another newer radio telescope, the Canadian Hydrogen Intensity Mapping Experiment (CHIME), is still not yet fully operational but made the news this week when it detected 13 new fast radio bursts, mysterious high-energy pulses from unknown, distant sources that have traveled billions of years across the galaxy. Potential explanations for fast radio bursts include magnetars (rapidly spinning neutron stars), neutron star-white dwarf mergers, collapsed stars, black holes, and—very much in last place in terms of evidence—some kind of artificial, extraterrestrial source. Among CHIME’s findings was the second-ever reported repeating fast radio burst, though mission staff told Science Magazine this week that they hope to eventually discover hundreds or even thousands of fast radio bursts.